Who is Microsoft’s best Dynamics Partner 2017? There are various awards for technology specializations, customer experience, and the best Dynamics partner by country and top Dynamics partner 2017 globally – the Microsoft Partner of the Year 2017. The full list of Microsoft Partner of the Year 2017 winners (with links to their websites) can be found below. 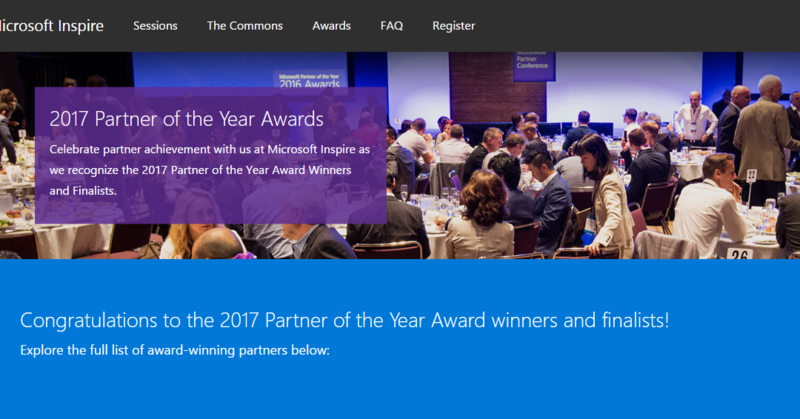 You can also read more details about these awards on the Microsoft Inspire awards page, and read the Partner of the Year 2017 winner statements for information about each of the winning Partners. Congratulations to all the partners, and especially to our customers who were finalists in this prestigious list. Alliance Global Commercial ISV: PROS Inc.
Kuwait: Diyar United Trading & Contracting Co.
Mauritius: The Cloud Factory EMEA Ltd.
Poland: Sagra Technology Sp. z o.o. Taiwan: Iscom Online International Information Inc.
Tanzania: Techno Brain T Ltd.
United Kingdom: CGI IT UK Ltd.